Let me give you a taste of how much it mattered to them. Rahm Emanuel the Democrat Mayor of Chicago, along with his Wall Street friends, allocated $25 million to break the strike. This is not including the relentless public campaign against the teachers, where top Republican stars came out in support of Rahm. Even after the teachers won, Rahm’s corporate funders spent $1 million simply to run television advertisements to spin the end of strike as a victory for the union-busting Mayor! Besides the money, Rahm thought he had the best ideological weapon against the teachers: he, Rahm was for the children of Chicago. The teachers were in the strike for themselves. It was a simple case of needy kids versus greedy teachers. I among several others have written before about how this ‘for the kids’ rhetoric is yet another case of sublime slime oozing out the Mayor’s office and an absolute lie. Today, however, I would like to argue something else: why all children at all reasonable opportunities, should be taken to picket lines and demonstrations when a group of people stand up and fight for social justice. Yes, taking kids to social justice rallies and pickets is very good for them. I am hardly the first person to propose this. Benjamin Spock, or Dr. Spock, whose Dr. Spock's Baby & Child Care (1946) is the second best-selling book internationally, following only the Bible, is a great supporter of more politics in children’s lives. In an uncertain world, with more uncertainty to come, we do well to ask ourselves just what our goals are in raising our children. Is doing well in school our most important objective for them? Is the ability to sustain intimate human relationships more important? Do we want them to be individualistic with a competitive edge so they can succeed in a dog-eat-dog society? Or do we want them to learn to cooperate and sometimes to renounce their own desires for the good of others? For Spock the answer is clear. He advocates two “necessary paths” to “make our society more cooperative and happier”. The first is to “raise our children with different ideals” and the second “to become much more politically active”. (Baby and Child Care, 836). Of course Spock’s philosophy of mixing diapers with demonstrations did not go unnoticed. After the brutal killing of unarmed anti-war students by the National Guard at Kent State University in 1970, the charming Vice President of the US, Spiro Agnew, blamed the parents of the slain students. "We must look to how we are raising our children” said the second most uninspiring man in the nation, “[parents of these students]…learned their Dr. Spock and threw discipline out the window--when they should have done the opposite”. What the Vice President was telling us: if we taught our kids to be against the napalming of other kids we, as parents, were responsible for our children’s future death by the Vice President’s men. Given that Agnew had to resign over bribery charges, one wonders what kind of parenting manual he was raised on: was it by Fagin or Al Capone? So let us examine closely why (a) it is important to take kids to picket lines and (b) why our rulers are threatened by such parenting. All parenting is political parenting, it is a matter of acknowledging which particular set of politics we wish upon our children. Every time we buy a Disney Princess for our daughters or a toy gun/matchbox Lamborghini for our sons, we are giving them a specific political perspective on our world. This is the dominant political perspective, which through toys (Princess for girls/guns for boys) books (Little House in the Prairie pushing rugged individualism) and clothes (pink for girls, everything but pink for boys!) attempt to socialize our kids into the world around them. Rich liberal moralists will wag their fingers at this point and say that there is an easy solution: to buy expensive gender neutral, progressive toys and books for the kids; to send them to (again, expensive) private schools where they have access to a wide spectrum of ideas. In other words, give the kids an organic- munching, alternative-everything, life that the majority of parents cannot afford. I am not opposed to searching for and buying good progressive books/toys for kids. Indeed, there should be more of them. What I am suggesting is that often this kind of buy-progressive rhetoric collapses itself into parenting being a lifestyle issue rather than a political issue. Most of us cannot afford to raise our children in a progressive bubble fortified by private education and alternative lifestyles. This is why barbies, guns and such assorted floatsam of capitalist propaganda do tend to find their way into most of our houses and playrooms. The most pernicious aspect of these toys is the fact that they are naturalized by capitalism as “normal”, while any objection or opposition to them appear as “political”. But if such toys and books are the samples of political parenting pushed upon us from the other side, our alternative to that is a self-conscious political parenting. By this I mean a parenting that allows us to discuss social issues with our children, and when possible to involve our children in movements or campaigns where people are collectively trying to right some wrong in our world. Any movement for social justice is a children’s issue: be it the anti-war movement, the movement for better schools or a campaign against racism. All such movements that try to fight the existing inequalities of our world are in essence fighting for the future: and children are the scaffolding that holds up all futures. The history of the Civil Rights movement in America offers us insights into how a mass movement can shape a generation of fighters. Children and young people played an essential role in the freedom struggle. From Barbara Johns leading a strike of her fellow students at Moton High against Jim Crow education, to the children of Birmingham who were brutalized by the police and arrested en masse as they protested the city’s segregation policies, children were in the thick of the struggle and in turn often help to shape and lead it. This is because black children were forced to learn about racism at their parent’s knees. Young boys were castrated, and young girls sexually assaulted, for breaking “race rules” in Jim Crow South. Thus, black parents had no choice but to teach their children lessons in race relations as a means of protection against racist violence. However, as a recent history of childhood in the South shows, the constant exposure to white racist violence also meant, that “by their early teen years, black children seemed more inclined than their white counterparts to translate their childhood experiences into action and calls for change”. The same is true today. The instability of our world created by the actions of our rulers means that we have a generation of children who are forced to live through the fall out of such actions. The Palestinian mother must teach her child how to duck bullets. The African-American father must teach his child that the neighborhood police car is a source of danger, not safety. As parents we teach our children everyday about dangers, big and small. But that defense is centered on the protection of the individual child, or family. Mass struggle against injustice are acts of defense by a collective for the protection of a whole community or class. Some times they are acts that are even greater than defending what we have: they blossom into demands for more: more schools, more hospitals, no more apartheid walls, nor more wars. When Martin Luther King asked the children of Birmingham to get involved in the fight against Jim Crow racism, he said that by involving children he was trying to “subpoena the conscience of the nation to the judgment seat of morality”. 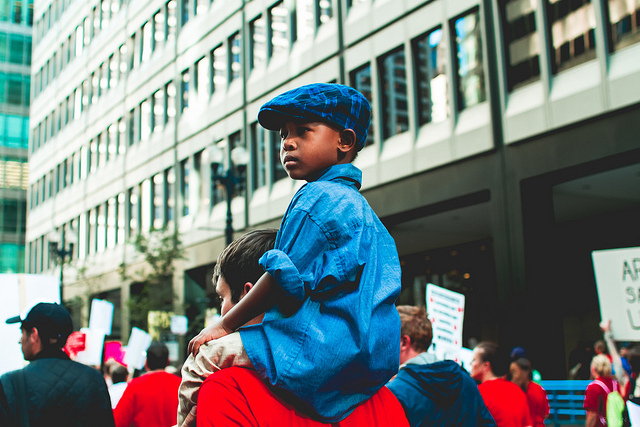 The recent CTU strike was a similar wakeup call for parents like us who think all children, not just the children of the rich, have the right to a decent school. The strike taught my grandchild and so many more children like her that people should stand up for what they believe in; to thoroughly read any document you sign; to join with people who have the same causes because many things can’t be done alone and that democracy is messy and hard to achieve, but worth it in the end. Not one week, or even one semester of civics, social studies or so called critical thinking instruction could teach that.. We saw and marched with the teachers, we heard them asking for fairness and we felt and agreed with their pain. If anything, our children were helped to have a greater appreciation for their teachers because they believe that the teachers stood up for them. What a great way for a new start! So next time there are people in your community fighting against a school closure, or against police violence, don’t forget to take your child to the meeting. It could be the best lesson plan she or he learns from.